Astrobiology is making headlines in space this week. 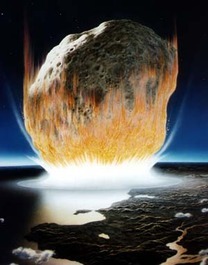 The origins of life on earth, formerly a bone dry planet, have been credited in part to icy hydrogen and organic molecule bearing comets slamming into earth, thus creating Earth's oceans and sparking aquatic life. A new discovery of huge quantities of ice evident on a 100 mile wide asteroid named 24 Themis, circulating within our solar system, changes that hypothesis. While comets come from the far nether-regions of outer space, asteroids- also known as planetoids due to their large size, come from our inner solar system and may prove to contain a cocktail of hydrogen and prebiotic molecules more in sync with our oceans. 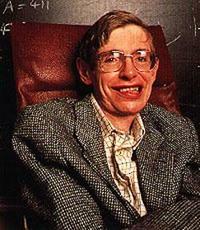 This afternoon, the Internet is buzzing with feedback from Professor Stephen Hawking's interview with The Times of London about his new series for the Discovery Channel, that will begin this May, and that looks at the certainty of intelligent alien life, and how the discovery of and the visitation by space aliens could effect us humans. NASA's space observatory, the Hubble telescope is twenty years old. It was sent into space on April 24, 1990, launched from the space shuttle Discovery. It is possibly the most educational, entertaining, and useful NASA project of them all, more important than the moon walk, in that it has brought, and continues to bring outer space right to our computer screens. We have had twenty years of incredible, awesome images of stars, and of worlds, and of objects beyond out planet -- data to scientists -- a delight to layman, in every part of the world. I have always found pictures of the objects in outer space very interesting. This morning, (April 22nd), on the net, something new appeared: the first pictures of the sun taken by NASA's new Solar Dynamics Observatory, a satellite sent into space to collect info on solar activity. The new satellite is to provide scientists with the data that they need to help them to predict solar storms that can cause serious disruption in earth communications. Also, to delight us of the post Star Trek generations, the satellite provides photo and video images to nourish our curiosity for what's out there, and to keep us in tune with NASA, when it's NASA budget time. Space shuttle Discovery returned to earth this morning, April 20, 2010, with a routine landing at Kennedy Space Center in Florida. Hardly even knew that she was gone. The US space shuttle was away, fifteen short days on a mission to the International Space Station. Lift off, return and the flight itself in so hum drum..The only bit of shuttle news is that there are only three shuttle space flights left, then the shuttle will be retired, and US space folks have to rely on the Russians or others or stay earth bound, until when? Whenever, the next US ships are ready to go. Also the returning flight flew over a large part of the US, giving the tax payers who watched, a nice show..The Atlantis is the next shuttle schedule to take a flight to space. Liftoff is targeted for May 14. Yes, so the Space shuttle Discovery return was routine? Routine is good. Read more about The Shuttle Returns, Routine. Star Trek's Data is no longer a pale sitcom character. Nasa's Robonaut 2 will fly out in September with the Discovery shuttle and work alongside astronauts in the International Space Station. 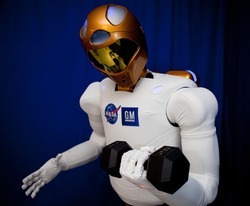 Built to work alongside humans, like a human – Robonaut 2 was developed by General Motors and NASA to be a complimentary companion, not a replacement, for astronauts. With dexterity and humanoid hands and arms, the robot is able to use all of the same tools and perform must of the same functions as its human counterparts, in terms of the space station. R2 will be monitored closely during its first anti-gravity field trip in September of this year, as machinery does not hold up or operate as expected in space, much like humans. Read more about Data is here. Keep Going Forward, Boldly, Right? 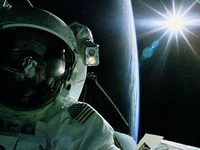 President Obama is facing pressure from most of the NASA community not to cut any space programs. Space is a high tech jobs program and NASA has contractors in every state keeping up the political pressure to keep up the spending to keep the highly trained workers employed. As a member of the post-Star Trek generation my heart is with those at NASA who want go to full-speed ahead with the whistles and the bells. That means a yes to every toy a space engineer can dream up. Read more about Keep Going Forward, Boldly, Right? 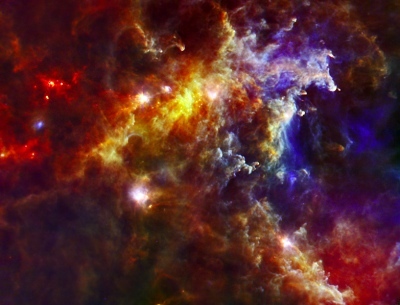 The Herschel Telescope captured this gorgeous image of one section of the Rosette Nebula, showing new stars. You can read more here. Click the image for a larger version.